Photo: andipantz (iStock), Graphic: Carl’s Jr. Though cannabidiol (CBD) is often name-checked as one of the fastest-growing food and drink trends, its legal status for use in restaurant food is murky. 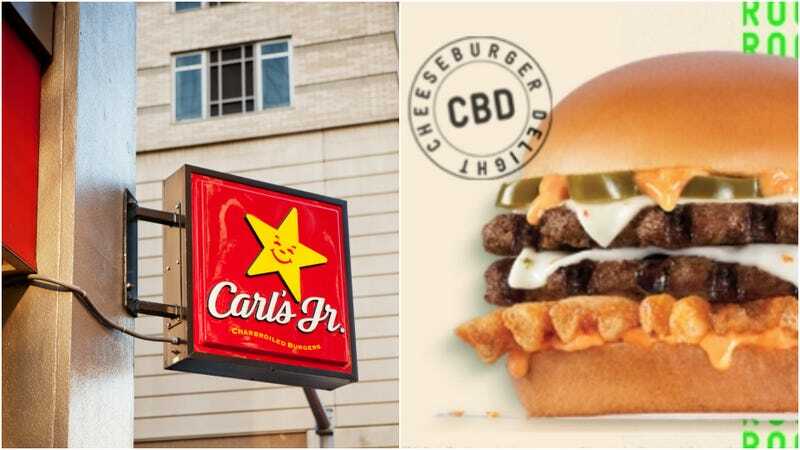 So it’s surprising to see news this morning that Carl’s Jr. will this weekend become the first national restaurant chain to add a CBD-infused burger to its menu. In a press release, Carl’s Jr. says the Rocky Mountain High: CheeseBurger Delight—see the CBD initialism?—will be available only on April 20 at one restaurant, located at 4050 Colorado Boulevard in Denver. Price tag: $4.20. Sales begin at 6 a.m. when the restaurant opens. The burger contains two beef patties and is topped with pickled jalapeños, pepper jack cheese, crunchy fries, and Carl’s Jr. Santa Fe Sauce infused with hemp-based CBD oil produced by Colorado-based Bluebird Botanicals. CNBC reports each sandwich will contain 5 milligrams of hemp-derived CBD extract. CBD is a non-psychoactive compound derived from hemp, meaning it won’t get a person high like tetrahydrocannabinol (THC) does. But its proponents say CBD promotes a feeling of calm, well-being, and relaxation, making it a popular addition to foods and beverages, even as the legal basis for such is sometimes unclear. The recently passed Farm Bill moved hemp—cannabis or cannabis derivatives with low THC thresholds below 0.3% by weight—to its own category, removing it from the federal list of controlled substances. Because the FDA has not yet approved such foods and beverages, even while marijuana may be legal in certain jurisdictions, restaurant food or beverage containing THC or CBD often is not. Health departments in New York and L.A. have recently cracked down on CBD-infused foods like cupcakes, lattes, and cocktails. In Maine, where marijuana is legal, the health department has also ordered shops and restaurants with CBD-infused products to cease their sales. Carl’s Jr. and its sister chain Hardee’s has a history of innovating in the realm of fast food burgers. In 2001, the chain (they’re owned by a parent company, CKE Restaurants) began offering The Six Dollar Burger. This was before burgers were considered gourmet, much less in fast food, and the idea of a burger that cost $6 was novel. The half-pound cheeseburger went on to become one of the chain’s top sellers. The Takeout has reached out to Carl’s Jr. to ask about where and how the CBD-infused sauce is prepared and whether that affects its legality; we will update this story with any response.